On this date in 1950, a 20 year old Roberta Peters made her MET debut in Don Giovanni. Fritz Reiner conducted the cast that included Jerome Hines as the Commendatore and Eleanor Steber as Donna Elvira. Ms. Peter's debut shot her to operatic stardom, some say, because of the stories surrounding her education, cultivation and experience - not to mention the MET audition to beat all auditions. More on that later. Roberta Peters was born Roberta Peterman in The Bronx, NY. She started study voice at age 13, encouraged by tenor Jan Peerce, with William Herman, a strict teacher known for giving exhaustive (and exhausting) training. Herman made sure Peters had French, German and Italian lessons and made her sing scales from a clarinet training book. After six years of training, Herman introduced her to Sol Hurok, an impresario of sorts who arranged for an audition with Rudolf Bing. If you don't know who Rudolf Bing was... shame on you - look it up. Bing had her sing the Queen of the Night's vengeance aria from The Magic Flute which contains four high Fs ... yes, that's F above high C. Bing didn't hear it once, he had young Roberta sing it seven times - if you do the math, that would be 28 high Fs. All the while, Bing listened from all parts of the hall to make sure she could fill the hall with sound. He then scheduled her to sing Zerlina in February of 1951. Things were not to work out that way as fate stepped in. Peters received a phone call from Rudolf Bing on November 17, 1950 asking if she could sing that night. That evening's Zerlina, Nadine Conner, could not perform. Peters obviously knew the role, but had never sung with a full orchestra, never performed in a full opera production, never even performed on stage, professionally or otherwise, except for her audition. She accepted and the rest, they say, is history. 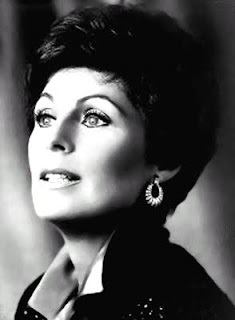 The surprise debut of twenty-year-old Roberta Peters, who was summoned to sing the role of Zerlina when Nadine Conner fell ill at three o'clock on the afternoon of the performance, gave the first Don Giovanni of the season an air of unusual excitement. The attractive girl won an immediate place for herself in her first appearance on any stage, and her fresh youth, pretty voice and stage wisdom provided the chief interest of the evening. From her first entrance at the head of a line of dancing country girls, Miss Peters never faltered in what seemed an ideal embodiment of the peasant bride and her gaiety and charm pervaded the scenes in which she appeared. Her voice was clear, accurate in pitch and focus and lovely in quality. Roberta Peters continued to sing at the MET for 35 years until her last performance there as Gilda in Rigoletto on April 12, 1985. Information comes courtesy of the MET Opera Database and Wikipedia.